“My name is W. Hock Hochheim and this is my Force Necessary:Knife course. It is a “painfully” simple course. Pun is intended. 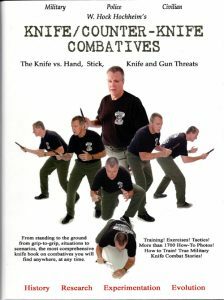 I only teach you the very essence of knife combatives, knife methods, and self-defense-survival for the citizen, the cop and the soldier. 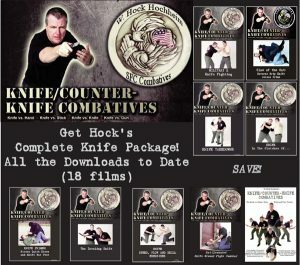 And I do hate the term “knife fighting.” I have been training in this for more than three decades, and teaching “the knife” worldwide for more than two decades, well before it was cool – as some people think I was part of a “new pioneer’ movement that brought the so-called “combative knife” back in the 1990s. Now my revered knife system is taught all over the world, as far as China and Australia. If you need more convincing, or if I am a stranger to you? Save time and click on on my bio page and my endorsement page on the links above. I have seen many knife fads and systems come and go. Many of them were and are shallow or crazy complicated and flashy. Many send the wrong message of sheer, mindless death and violence, ignorant or flippant about the harsh realities of knives, law, crime and war. As a “martialist” and not an artist, I am military and police vet, a detective of many knife attacks, robberies, aggravated assaults, attempted murders and murders, I have a special view of the ‘knife.’ And yes a martial arts vet, with a lot of time and grade in the Filipino martial arts, one regarded for its study of the edged weapons. Criminal and military history reveals that a real world knife fight is more rough and tumble (like football or rugby) and less like fencing. So-called “dueling” can happen, but it is an event least likely to occur in our modern times of mixed weapons in war, crime, emotion and ambush. In this knife combatives course, I have carefully crafted a doctrine where you will learn how to use a knife to its maximum potential in all grips: standing, kneeling, sitting and on the ground, with less-than-lethal and lethal results. In this course, I have carefully crafted for you a doctrine where you will learn how to use a knife to its maximum potential. This doctrine includes all the better parts of military knife fighting-such as Russian Knife Fighting, South African and Rhodesian military knife fighting, as well as Filipino knife fighting, American and European or ‘western’ knife fighting. Also, this includes a study in criminal and prison knife fighting and knife self-defense. 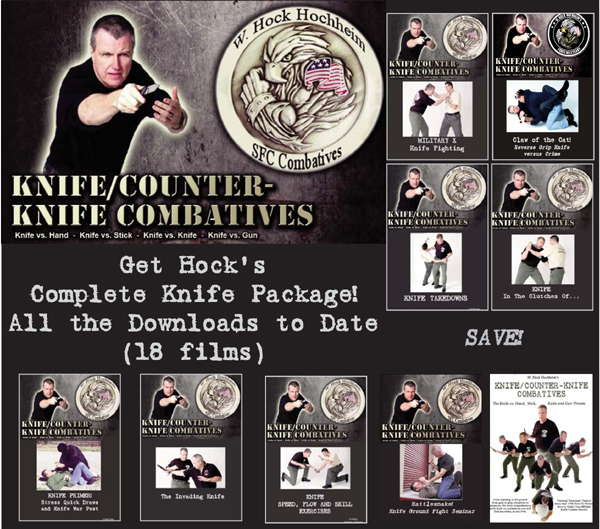 Plus knife combatives training innovations.